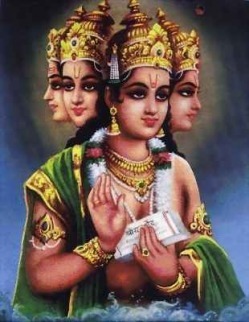 Brahma is the Hindu god (deva) of creation and one of the Trimurti, the others being Vishnu and Shiva. He is not to be confused with the Supreme Cosmic Spirit in Hindu Vedanta philosophy known as Brahman. Brahmā's consort is Saraswati, the goddess of learning. Brahmā is often identified with Prajapati, a Vedic deity. Vishnu ( Devanagari विष्णु), (honorific: Bhagavan Vishnu), is the supreme God in Vaishnavite tradition of Hinduism. Smarta followers of Adi Shankara, among others, venerate Vishnu as one of the five primary forms of God, and his supreme status is declared in the Hindu sacred texts like Yajurveda, the Rigveda and the Bhagavad Gita. The ten incarnations of VishnuThe most famous of the divine incarnations are Rama, whose life is depicted in the Ramayana, and Krishna, whose life is depicted in the Mahabharata and the Srimad Bhagavatam. The Bhagavad Gita, which contains the spiritual teachings of Krishna, is one of the most widely-read scriptures in Hinduism. 1. Matsya, the fish, appeared in the Satya Yuga. Represents beginning of life. 2. Kurma, the tortoise, appeared in the Satya Yuga. Represents a human embryo just growing tiny legs, with a huge belly. 3. Varaha, the boar, appeared in the Satya Yuga. Represents a human embryo which is almost ready. Its features are visible. 4. Narasimha, the Man-Lion (Nara = man, simha = lion), appeared in the Satya Yuga. Represents a newborn baby, hairy and cranky, bawling and full of blood. 5. Vamana, the Dwarf, appeared in the Treta Yuga. Represents a young child. 6. Parashurama, Rama with the axe, appeared in the Treta Yuga. Represents both an angry young man and a grumpy old man simultaneously. 8. 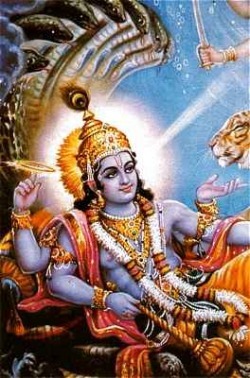 Krishna (meaning dark or black; see also other meanings in the article about him. ), appeared in the Dwapara Yuga. Represents a person in more practical society, where there is one good or bad. Good or bad depends on society you live in. 9. Gautama Buddha is considered an avatar that returned pure dharma to the world. 10. Kalki ("Eternity", or "time", or "The Destroyer of foulness"), who is expected to appear at the end of Kali Yuga, the time period in which we currently exist, which will end in the year 428899 CE. There is also a "hidden avatar" mentioned in 11th canto of the Bhagavata Purana. Some consider Balarama, brother of Krishna to be the eighth avatar of Vishnu, and delete Buddha. The Buddha avatar, which occurs in different versions in various Puranas, may represent an attempt by orthodox Brahminism to slander the Buddhists by identifying them with the demons. Helmuth von Glasenapp attributed these developments to a Hindu desire to absorb Buddhism in a peaceful manner, both to win Buddhists to Vishnuism and also to account for the fact that such a significant heresy could exist in India. Shiva:(pronunciation: Sanskrit: शिव, Siva, lit. "Auspicious one") One of the Trimurtis. 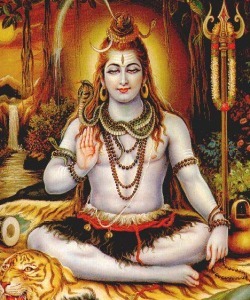 Shiva is the supreme God in the Shaiva tradition of Hinduism. In the Smartha tradition, he is one of the five primary forms of God.